SIMBA is the 5-letter name of my 4-legged family member who means sheer joy! Yes, he is our darling Labrador who has added sparkle to our life when things were going wrong and stress was the order of the day! He came as a small bundle of fur—small enough to crawl under the bed. In no time he has grown up to be a huge handsome fellow who has the typical Lab look that says, “How could u?” whenever scolded!!! Ever playful, he just can’t understand why other dogs bark and growl when they see him, even though he is always eager to go near them and explain with a wagging tail! Given the fact that he will be a large dog, we have trained him since he was 3-month-old and the effects are there to see! 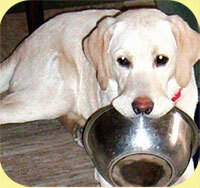 Apart from sit-stay, get it /drop it, go sleep, go AC, get chain …the best command he has learnt is NO — especially when food is served — poor guy waits with saliva drooling down his mouth… for the click of fi ngers—that means EAT! Catch me (when he has stolen my son’s tattered shoe!) — that’s a game he is never tired of. But what amazes me is his GET BAATEE (bowl in Bengali) game — he will rush to bring his food bowl and sit beside you with bowl dangling in his mouth till you succumb with some treats! Not only this, there is so much to learn from this near 2-year-old! Forgiveness, patience, immense loyalty …always happy, always ready to please, by your side through ups and downs…the list is endless. Simba is more than just a dog – he is a God sent blessing, we are so thankful of!